↑ "The Nanking Atrocities: Fact and Fable". Wellesley.edu. Archived from the original on February 28, 2011. Retrieved 2011-03-06. ↑ Bob Tadashi Wakabayashi, ed. (2008). 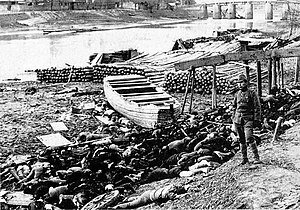 The Nanking Atrocity, 1937–38: Complicating the Picture. Berghahn Books. p. 362. ISBN 1-84545-180-5. ↑ "论南京大屠杀遇难人数 认定的历史演变" (PDF). Jds.cass.cn. Archived from the original (PDF) on 2014-03-22. Retrieved 2016-03-16. ↑ "近十年" 侵华日军南京大屠杀"研究述评" (PDF). Jds.cass.cn. Retrieved March 16, 2016. ↑ "Modern China" (PDF). Archived from the original (PDF) on March 6, 2016. Retrieved May 30, 2014. Totten, ਸਮੂਏਲ. ਕੋਸ਼ ਦੀ ਨਸਲਕੁਸ਼ੀ. 2008, 298-299. Iris Chang, ਬਲਾਤਕਾਰ, Nanking ਦੇ, ਪੀ. 6.